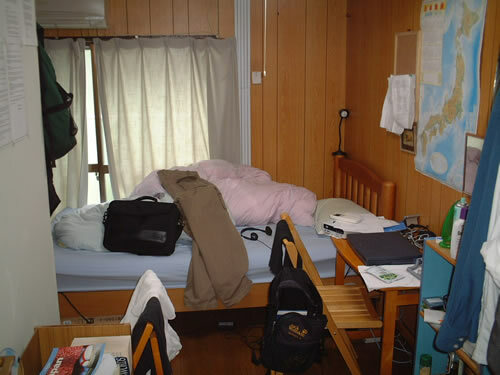 Ok so here's my room. It might be messy but that's the way I like it. It's hard to get an idea of it's size from this picture so let me clarify. When I get out of bed I have roughly enough floor space to walk maybe three steps to the door. It's cozy though, well maybe for one. 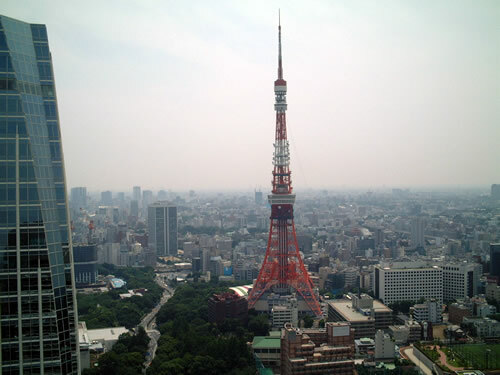 Here's Tokyo Tower from my friend Scott's apartment. Those aren't clouds on the horizon, that's smog. This picture just doesn't do Tokyo justice though, this is only one view, and with a narrow lens too. A 360 degree view is much more impressive, Tokyo streches off to the horizon in all directions like mouldy grey lego. The greatest sport ever! Here are a few of the guys and girls that I play with every Sunday (as long as it doesn't rain), sorry to the people who aren't here and there are a lot of you. This just happened to be one day when I remembered my camera. I'll try to get a few more ultimate pics up here soon. Here's my previous place of employment. Stage-line allows all of it's students to come and sit in the lounge during their free time and just talk with the teachers. A good system I think and students can use it for free! This is what I need to practice speaking Japanese! That's Alina (part-time teacher) in the right corner chatting it up with the students. 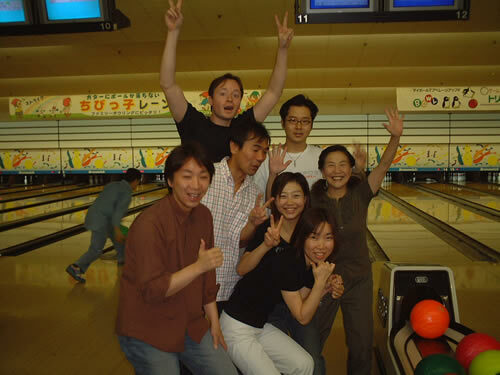 Stage-line recently had a bowling tournament and that's me with my team members. I did pretty good if I do say so myself, two games and my scores were 145 and 136, guess I'm just a natural athlete. The guys are from left to right: Kouichi, me, Kouichi's friend, and Yuuichi. The girls from left to right: Minako, Chieko and Naoe (Minako's mom). Good work team! Stage-line's star student, he deserves a comment all to himself. He joined Stage-line in June, and since then, he has been coming to Stage-line everyday, (except Monday when we're closed) continuously studying and learning for about 6-7 hours everyday. His plan is to go to America in January and study at an American university. His motivation is an inspiration to everyone. After a hard game of ultimate there's nothing like beer. A lot of it. If you look closely you can see our 4 litre beer tower sitting on the table. First find me, the guy in the back wearing the black shirt, then look to my right. Can you make out the shiny, golden pipe-like object? That's not part of the wall, it's our beer! Cheers! Stage-line and I finally went our separate ways and the only thing I can really say is 'finally!' 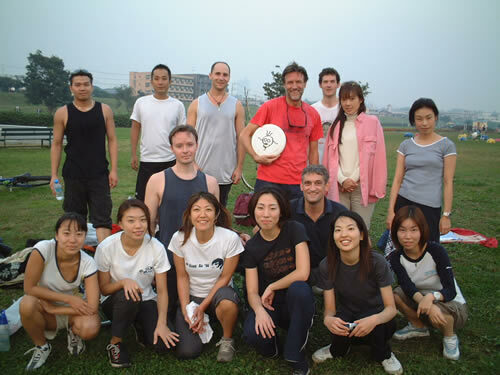 Here's me, surrounded by some of the students and staff just after my farewell party. Kinda sad to leave, especially since I was there since the very beginning. Off to greener pastures I hope! Alright, here's to better days in the future! Food in Japan might be expensive, but you can find great deals for lunch. 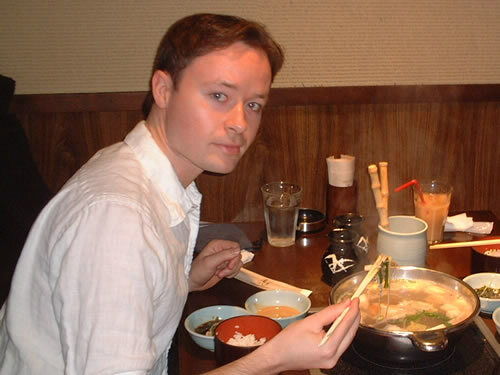 Yoko and I were wandering around Shinjuku one afternoon and we found this all-you-can-eat Shabu-Shabu place for 1000 yen each. Shabu-Shabu is thin slices of beef, vegetables and tofu which you cook in a big bowl of broth right at your table. Here's me about to stuff my face. The two of us managed to get through 3 plates of beef each not to mention rice and vegetables before our stomachs gave up.